Governor Sununu’s recent signing of HB 1264 should concern residents of the Granite State. Although the New Hampshire Supreme Court ruled that the bill was constitutional, the motives for passing it are flimsy nonetheless. In justifying his decision, Sununu invoked nice-sounding platitudes like “equality” and “fairness.” But it’s hard to ignore the bill’s political expediency. For one, it hinders a large number of New Hampshire’s college students from voting — a demographic which largely votes Democratic. According to the Campaign for Voting Rights, the new law would also require voters to obtain a New Hampshire driver’s license and car registration, which effectively functions as a poll tax. Sununu also made Trumpian claims about the old system being rigged. He said that same-day registration allowed nearby Massachusetts residents to be bussed into New Hampshire near election time. But a few months before HB 1264 was passed, Sununu’s own Secretary of State William Gardner delivered a two-hour presentation, along with other election officials, that concluded there was little evidence for voter fraud. New Hampshire was the last remaining state to enact such a law. But in a state where the motto is “Live Free or Die,” citizens must remain vigilant and demand transparency from Sununu and their other elected officials. 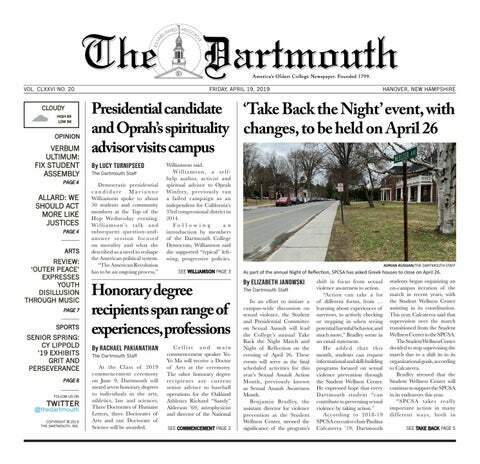 Restricting voting rights for students at Dartmouth is both unacceptable and unbelievable. Although many of us are not residents of the state, our word often has a large say in elections, and the status of New Hampshire as a swing state amplifies this responsibility. As someone from a majority-Democratic state, I understand the value of having my vote cast in an actual toss-up state, something that should be seen as a value to any party in an election. This is a sad attempt by conservatives at limiting the rights of liberals in a despicable way. The bill is disenfranchisement, plain and simple. No one seriously believes that this measure is about voter fraud, or about students’ supposed long-term dedication to the state. Both of those arguments fall flat. Voter fraud in New Hampshire is essentially non-existent. The second argument is more concerning, since it asserts that only certain types of citizens deserve the right to vote. This argument is an anti-democratic one, and one with a troubling history in the United States. Whether one excludes voters on the basis of literacy, student status, race, criminal history or any other arbitrary factor, the aim is clear: advancing partisan interests against the will of the people. The most worrying aspect, though, is that this bill is not alone. It stems from the broader tribalism that’s come to characterize American politics. In a democratic republic, elected leaders should base policies off the will of the electorate. Instead, we’ve swung toward a winner-takes-all approach, where the aim is, as our president so often puts it, “winning” against one’s political opponents. To the partisan, securing favored policies takes precedence over democracy. The partisan has few qualms about disenfranchising the opposition — after all, it makes elections easier to win. This authoritarian mindset is fundamentally anti-American, and it characterizes some of the darkest periods of our nation’s history, most notably the Jim Crow South. Sadly, with this bill, Governor Sununu has shown himself a true partisan. Rather than serve the people of New Hampshire, Sununu has disenfranchised many of his constituents in order to advance a particular ideology. With this measure, Governor Sununu and large factions of the New Hampshire legislature have undermined their commitment to democracy. That should disturb everyone, regardless of party affiliation. We still have a few months before the disenfranchisement bill takes effect. So vote. Whatever your politics, register and vote this November. Sununu is up for reelection, as is Representative Annie Kuster and our state-level delegates. This election matters. So vote. Make your voice heard, now. It’s our last chance. As an out-of-state college student who hails from a non-swing state, I’m inclined to say that it would certainly be more exciting to be able to vote in New Hampshire. However, I wouldn’t consider myself a long term or continuous New Hampshire resident — I’m in Hanover maybe half of the year, a few weeks at a time. If I were to put myself in the shoes of a long term New Hampshire resident, especially one who typically votes red, I would not want my vote to be diluted by an influx of college students who not only represent their home states but also tend to have more liberal values. According to vote.org, many other states require proof of residency in order to vote. New Hampshire has been fairly lax about voter registration until now. I’m not happy about Governor Sununu’s voter residency law, but I do think it’s fair from an electoral perspective.